15 Indoor Christmas Decorations Ideas for This Year! Christmas is near and you very well know what that means, its time to bust out the Christmas tree! Indoor Christmas decorations ideas are our gift to you this season! Check out these festive holiday decorations that are sure to get everyone into the spirit! Indoor Christmas decorations is as big fun as opening presents on Christmas morning. A great way to celebrate the Christmas festival is to bring alive the joyful spirit of Christmas in your home. Whether you are treating guests for a holiday party or you want to make your house feel pleasant and festive for your family, to make some thoughtful efforts and decorate your home in a manner that will help you and your visitors value the cheerful Christmas design ideas is a creative part which you ought to know. While there are lots of interesting decorative indoor Christmas decorations items readily available in the market. We still recommend and exploit your own creativity and present an innovative and new look to your sweet home in your style different from others. To bring alive the Christmas (yuletide) spirit in your house, little efforts are needed to decorate the each and every area of your house. However, some extra attention should be paid to the living room area as this is place where you receive your guests and celebrate the festival! Indoor Christmas decorations ideas for the house help to add charm to the holidays. Set a festive holiday mood throughout your house with our simple indoor Christmas decorations ideas. Must Read: Outdoor Christmas Decorations: 19 Best Ideas for Your House! Christmas tree is very significant object for Christmas festival. If you don’t do anything else, only get a tree, it is enough! You can choose either a real or artificial christmas tree and set it up in your home where your family usually celebrates Christmas day. Stockings which are homemade can be set against a beautiful foliage of flowers and gold/silver/copper Christmas decor items and ribbons makes an attractive hanging display to your wall itself! You can find a fresh mistletoe in a nursery or even in hardwood trees of your backyard or neighbourhood garden. You can also buy a faux mistletoe plant to hang on a doorway or between rooms of your house. You can use red ribbon to tie which will make it look more festive! And of course encourage people to give each other a kiss if they find themselves standing beneath the mistletoe together! There is a belief behind mistletoe i.e. during the Christmas time a young lady standing under a ball of mistletoe, brightly trimmed with evergreen, ribbons, and Christmas ornaments, cannot refuse to be kissed. Such a kiss could mean deep romance or a lasting friendship and goodwill. If the girl remained un-kissed, she cannot expect not to marry the following year. There is a strong belief behind the mistletoe know in detail about it! You can use some of supporting banisters and windows to hang the Christmas creative and attractive cards by using clips or clothespins to string them along the staircase. It is a simplest way to start the indoor Christmas decorations. Mostly people display the Christmas wreath on the doors which symbolizes eternal life to the family. You can buy or make christmas wreath of fresh and sweet smelling like evergreen. Christmas wreath will make your house look like welcoming your guests and also indicate to the passers that your house has a spirit of Christmas! The simple way of using candles for Christmas festival is to wrap them up in your favourite carols and hymns and decorate it in your living room or on top of a piano. Candles in windows of your house are always classic and will add colours to your windows! If your style is subtle and serene, consider placing an electrical candle in each window of the house. This is a beautiful way to decorate Christmas festival without spending too much money on big indoor christmas decorations! Paper snowflakes are easy and fun to make. All you need is a paper, scissors, and some string and tape if you want to hang them up. Making paper snowflakes is a great activity to do with the kids. Red and green are the colours of Christmas festival, so any celebration theme that has this colour scheme will make your house look more festive with many indoor christmas design ideas! You can get creative with red and green items around the house. For e.g. you can use red and green pillows, bows around door knobs, Christmas bells, Dish clothes of your kitchen, Candles. Also buy Poinsettia plant to add Red and green, whoever! 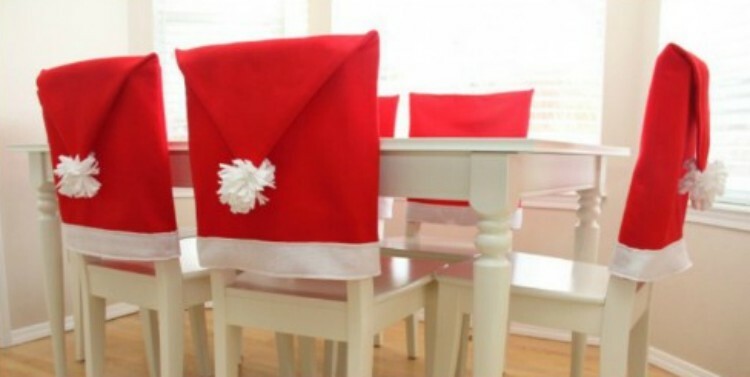 You can simply transform your dining area by taking some inspiration from the Man In Red called Santa who is favourite of all kids! These covers are totally machine washed safe, so that the cookies dough will come right out when the holidays are over! Another great product to steal from nature is holly tree (an evergreen whose stiff, glossy, sharp-pointed leaves and clusters of red berries are used in outdoor & indoor Christmas decorations). Trim a few branches off a bush, mix it with some evergreen needles you have found outside or put in an old picnic basket with other greenery. You can decorate it with glitter. It’s perfect for the Hollydays! There are lots of typically forgotten spaces in our homes that you could use to lit up for Christmas festival or eve. The most obvious one is the space between the rooms that is the hallway! You can make it magical by simply stringing up some style lights across the ceiling. Hang some lights at the top borders of walls where the ceiling meets the wall. If you have enough lights to do it, string up some lights around the room you will be presenting most of the Christmas festivities in! Another important area we should not forget is the Stairs! 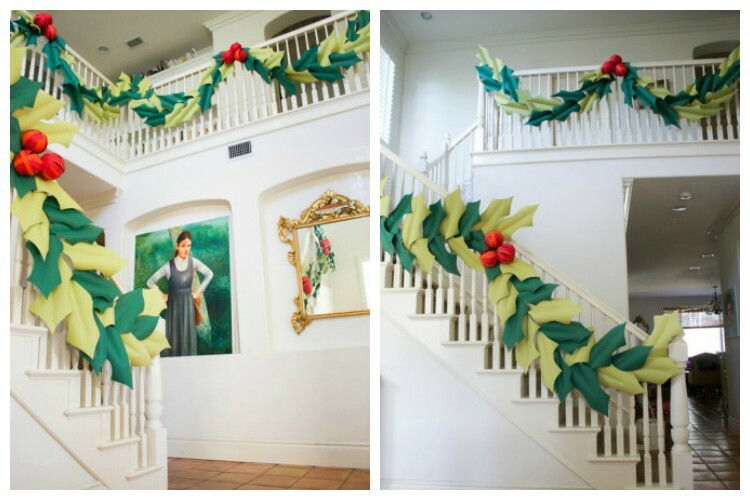 While we grew up with regular garland wrapped around the banisters. It’s a time to decorate your stair by enchanting DIY (Do It Yourself) ideas for one made of glowing lights along with snow-like fabric! The inside weather can be delightful with this idea of decorating the blank space of your home by cotton balls and string – christmas ornaments, and it’s simple and easy. You can make your own advent calendar using simple envelopes and stick it on the numbers to transform a large soft board. Fill each envelope with the treats such as a coupon good for an extra hour of playing video games, candy canes, gift certificate to the ice cream parlor which are enjoyable and surprising. With the promise of small treasure every day till 25, the kids will love counting down the days to December 25. 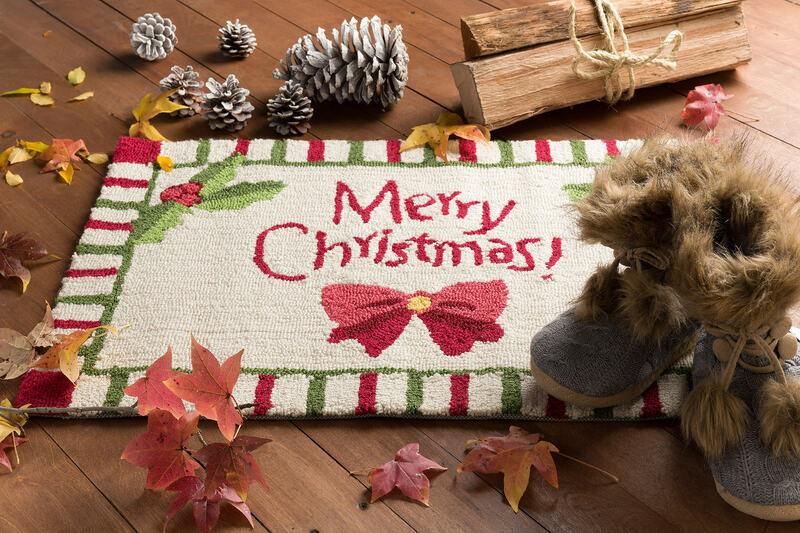 Set out the entry doormats inside or outside that have a festive Christmas theme.